At last, after four days of irritating rain, a settled day – not sunny but settled nonetheless. A slightly stir-crazy Franco and Francine made good their escape from camp à bicyclettes. We were off in search of coypus or ragondins as they are known over here. At least, the polite members of marais society call them ragondins. There are apparently much less polite names used by others since these large aquatic rodents do great damage to the banks of the canals and are regarded as a serious pest. Somewhat typically, the French have turned the pest into a resource by putting down traps baited with sliced apple and, in turn, turning the hapless trapped ragos into pâté de ragondin. Yum! We caught a brief glimpse of just one coypu as it swiftly clambered out of its canal and began hiding on the bank that it had set about destroying. Camera not required, regrettably. 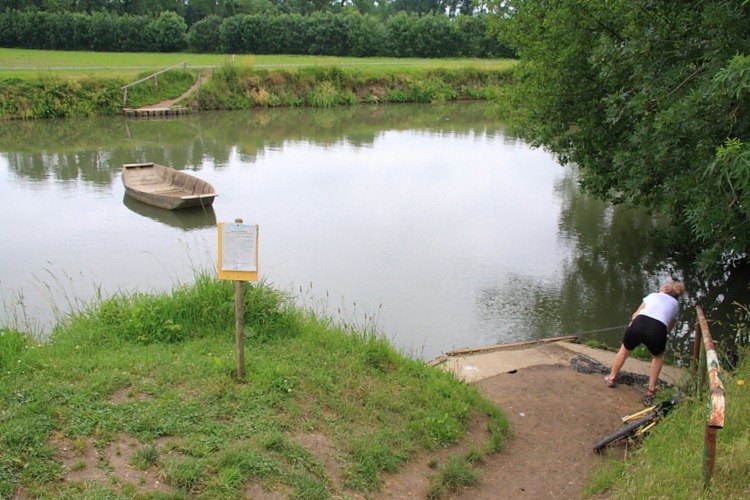 We did have a very pleasant bike ride, though, which included a slightly heart-in-mouth crossing of the river Sèvre Niortaise on a bateau à chaîne (chain boat). The chain boats were an traditional old method of getting about between otherwise isolated sections of land in the marais (marsh) before the advent of roads. Two chains attach either end of the boat to either bank of the river. We were a little timorous but keen to give it a go. Francine gamely grabbed one chain and lugged the boat, which was, of course, on the opposite side of the river, across the water towards us. Getting both bikes and both of us aboard was a tad dodgy but we made it safely and, once aboard, the boat proved to be very stable with its wide, flat hull. Francine leapt into action once again, this time on the other chain, and dragged the boat, us and our two bikes over to our destination on the other side of the river. Disembarking was an equally delicate process. I soon learned that it was necessary to place all the retrieved chain inside the boat when mooring it to prevent the boat drifting off downstream.